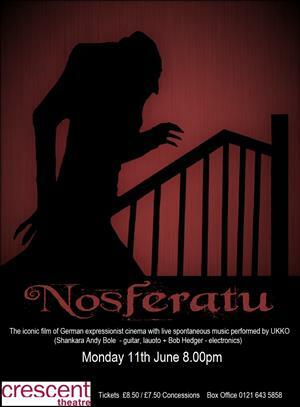 The iconic film of German expressionist cinema with live spontaneous music performed by UKKO. Nosferatu, A Symphony of Horror is a 1922 German Expressionist horror film, directed by F. W. Murnau, starring Max Schreck as the vampire Count Orlok. The film, shot in 1921 and released in 1922, was an unauthorized adaptation of Bram Stoker's Dracula (1897). Various names and other details were changed from the novel: for instance, "vampire" became "Nosferatu" and "Count Dracula" became "Count Orlok". It doesn’t scare us, it haunts us.